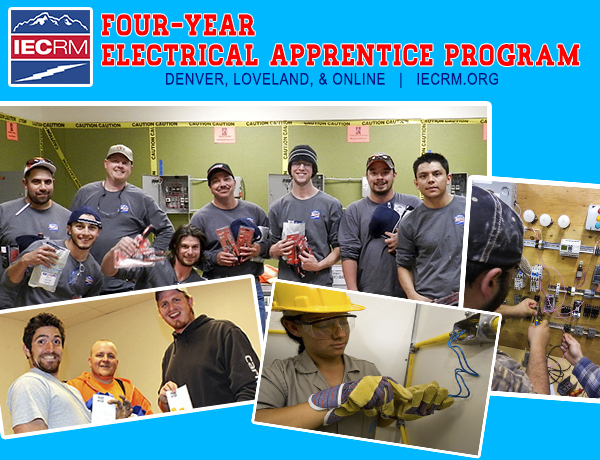 IECRM is the Rocky Mountain region’s largest electrical apprentice training institution with over 1,800 students currently enrolled in the program. 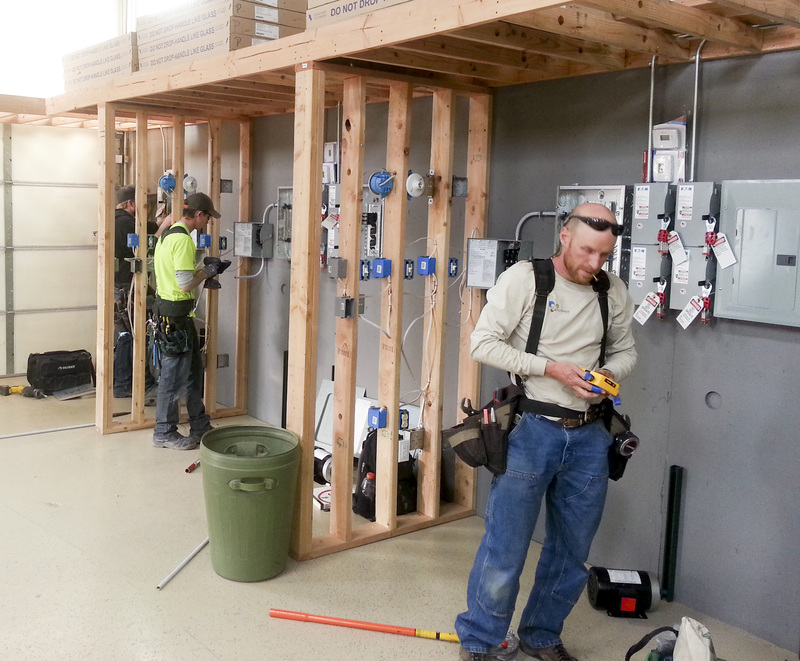 We are the first and only State Approved electrical training school in Colorado. Are you ready to learn more? Click here to see how to get started! For more information on the career opportunities and benefits of an IECRM education, call IECRM at 303-853-4886. 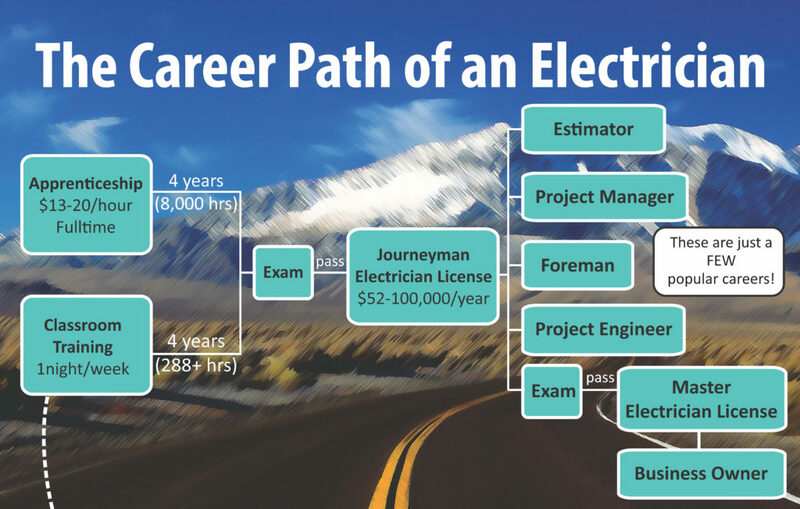 In order to take the license exam to become a Journeyman electrician, an individual must have a combination of 4 years of apprentice experience (8,000 hours on-the-job training), and at least 288 hours of classroom training. Please see this link to Title 12, Article 23 of Colorado’s Revised Statutes for more detailed information. How can IECRM help me find a job as an apprentice? 1. Get on our Hire List, which contractors use to find new apprentices – please follow these instructions. 2. In addition, please visit our ONLINE JOB BOARD to see a current list of local companies hiring for new apprentices! When do classes start at IECRM for NEW apprentice students? Open Enrollment for New students (“First Year Apprentices”) is held mid-June through mid-July of each year. New students will begin their first year of classroom training at IECRM in August of each year. The first year ends in either May or June of the following year. There are two semesters per school year. Students can attend class in Denver, Ft. Collins, or Live-Online. In addition to August start, IECRM has a LATE START program for First-Year Students ONLY. Enrollment for the Late Start program opens in mid-September of each year and will close the last Friday in September or when all seats are filled. Late Start students can attend class in Denver or Live-Online. If you are not yet working as an apprentice: You are encouraged to apply first. Learn how to apply here. Read FAQs about the Apprentice Program here. If you are already working as an apprentice, OR you are a contractor trying to register one of your apprentices for schooling, please continue down to “How to Register” below and follow those instructions. To register, your employer must register you online using AMPS. If you are a student who is paying his/her own tuition, please call Annette at (303) 853-4886. IECRM prides itself on the passion and talents of our instructors. Our instructors are dedicated to teaching over 1,300 apprentice students and shaping them into highly skilled, highly trained, and highly motivated electricians. 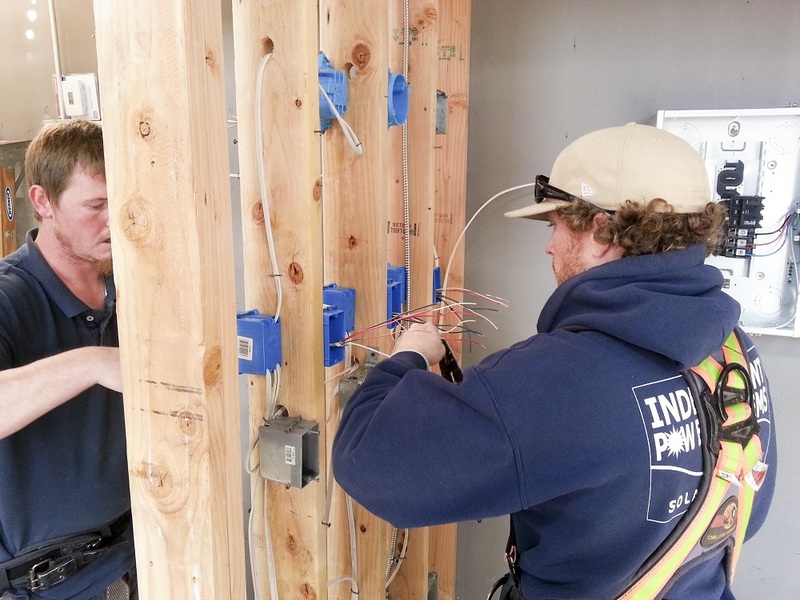 As licensed electricians themselves, they bring a wide range of experiences to the classroom which help our students develop an interest and understanding for the real-life applications and impacts of their skilled trade. Quite a few of our instructors own their own successful contracting companies. What is the curriculum for each year of training? The entire four years of curriculum can be viewed here. I have a job. Will classes affect my work schedule? 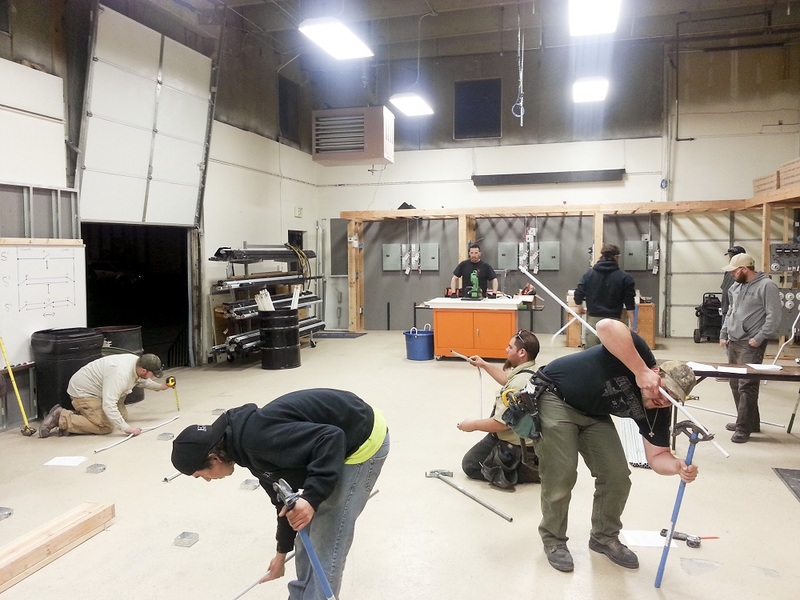 The vast majority of our students are employed as apprentices with electrical contractors during the day, and come to class at IECRM once a week from 5:30pm – 9:30pm. This means that classes should not affect students’ ability to work a full-time job as an electrical apprentice. We also offer the option of Live-Online Apprentice Training, which also runs from 5:30pm – 9:30pm, once a week. Because this class is taught live by instructors over the web, it is a unique program unmatched by any other electrical training program in the region! How much is tuition at IECRM? Early Registration Tuition Prices – Register and pay-in-full during Early Registration to get the best pricing on tuition! *Books are not included in the cost of tuition. The cost of books ranges from $400-$600 per year. Regular Registration Tuition Prices – Pricing after early registration closes. Learn more about how your company can become a Contractor Member of IECRM. Quite a few of our students are assisted with tuition costs by their employer. If you are a student planning to pay your own tuition, please call IECRM at (303) 853-4886 to find out about tuition payment options. I am a US Veteran. Can I use my GI Bill benefits for the IECRM apprentice program? Yes, you can apply your GI Bill benefits to apprentice training! If you are a Registered Apprentice: If you are currently working as an apprentice for an electrical contractor, and if you have been registered with the OA/BAT program (registered with DOL), you may use your GI Bill benefits to pay for schooling. Note: OJT is required for monthly payment of benefits. If you are a Non-Registered Apprentice: If you are currently working as an apprentice for an electrical contractor, and you have not been registered in the OA/BAT program (registered with DOL), you may use your GI Bill benefits to pay for schooling. Note: OJT is required for monthly payment. Additionally, if you are unemployed, you may apply for Tuition Assistance through IECRM. IECRM gives US Veterans priority for Tuition Assistance, as long as all other Tuition Assistance requirements are met by the individual. Please visit IECRM.org/veterans to learn how to apply your GI Bill benefits, apply for tuition assistance, and get more information on the benefits we provide to our Veterans. Can I use the Job Training Tax Credit for apprentice tuition? If your company is located in one of Colorado’s Enterprise Zones, your company may be eligible for a tax credit toward job training expenses for your employees. The Job Training Tax Credit may be applied toward what your company spends on IECRM apprentice training (including the Live-Online Program) and continuing education classes for your employees. Please visit IECRM.org/tax-credit for a helpful guide to this tax credit. What tools do I need for my first year? I live outside of Colorado and Wyoming. Can I apply to the program? The IECRM apprentice program fulfills state licensing requirements for the states of Colorado and Wyoming. Check to see if your state has a local IEC Chapter – click to view the full list of IEC Chapters. Your local chapter will be able to tell you if they offer an apprentice program near where you live, and they will also be able to tell you the apprentice training requirements for your state of residence – this is imperative because apprentice requirements vary from state to state. If your state does not have a local IEC Chapter, you must check with your state of residence to find out the apprentice training requirements within your state – this is imperative because apprentice training requirements vary from state to state. Contact IECRM with your state’s apprentice training requirements, and if our program meets your state’s requirements, we will begin the application process for the Live-Online Apprentice Training Program over the phone. a. 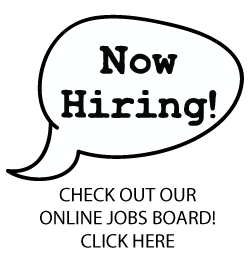 You do not need to come into our Denver office to fill out an application. We will take your information over the phone. b. Please note, the OA/BAT program is not available to apprentice students outside of Colorado and Wyoming. c. If you are a contractor interested in membership with IECRM, you may have an option to become a Member-at-Large with our chapter. Please contact Mary Beth Armbruster, IECRM Director of Operations and Member Services, for details, at (303) 853-4886. Please call us during business hours, Monday through Friday, 9am – 5pm. We would be glad to answer your questions! Please see How to Get Started.